Matadors are known for extravagant embellishments on their clothing, giving the bullfighters a very dapper look. 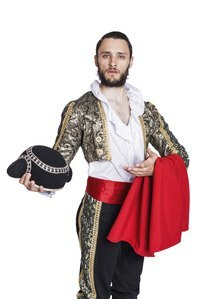 When making your own matador costume, you can add as many or as few appliques and adornments as you'd like depending on your personal taste and what supplies you have available. You may already have several of the items you will need to make a matador costume, or they can easily be sourced at your local thrift and fabric store. Cut off the bottom of the dress jacket so it is cropped at the waist. Hem the cut edges. Sew strips of gold trim down each of the sleeves. Adorn the shoulders, front and back of the jacket using additional trim and rope appliques. Replace the existing buttons with gold ones. Decorate the jacket any way you wish. You can find inspiration by looking at photos of matadors on the Internet. Sew a strip of gold trim down the outside seam of the leggings. Add additional rope appliques, if desired. Put on the leggings and dress shirt. Tuck the shirt into the pants. Tie the cummerbund around your waist and put on a black tie. Pull a pair of white socks on so they stop just below your knees. Wear a pair of black slippers or whatever black shoes you have on hand. Complete the look by carrying a red cape and sporting a montera – the black caps worn by bullfighters. You can wear your hair in two tight buns, one just above each ear, to replicate the look of a montera. If you have long hair, it should be pulled back and tight. Hide it under your montera, if possible.